"Metal Men" - Part 3: "Computer Crash"
Helen and Doc Magnus track down the Metal Men and are captured by Brainiac. Elsewhere Clark Kent asks Bruce Wayne why he would keep a prototype of OMAC around. Bruce tries to explain that because he was an orphan he has a hard time letting things go. He tells Clark about a tracking device he created to keep tabs on the prototype and Superman flies off to find the OMAC and Brainiac. Meanwhile Brainiac explains his reasons for stealing the OMAC prototype before Superman arrives and launches his attack. The Metal Men join in the fray as well as the now "OMACed" Helen but with Batman's assistance the Metal Men break free of Brainiac's control. Helen and the Metal Men gang up on Brainiac and destroy the shell he had inhabited. Later Superman uses his heat vision to melt down the OMAC prototype while he and Bruce discuss the ramifications of recent events. Bruce contends that because any hero has the possibility of going rogue the concept of an OMAC type contingency plan may be a necessary evil. Superman asks Bruce why he is allowing the destruction of the prototype. Bruce replies that knowing each other as long as they have that Superman should know that Bruce had more than one contingency plan. Story - 3: So the question becomes does a story that has a strong beginning, a very weak middle and a kind of solid ending deserve to be thought of as a good story over all? That thought has been swirling around my head since I read this issue two days ago. It's a valid question really. I liked the first part, hated the second part and thought that while the ending wasn't amazing it wasn't terrible either. I'm in a bit of a quandary over it and like just about any time this sort of thing happens I think the problem to death until it becomes, in my head, more epic than it really needs to be. As a story where super-heroes fight robots I think this arc was something of a success. I mean Superman fought the Metal Men. 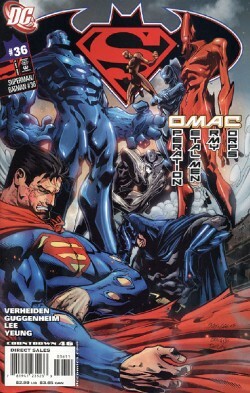 Superman and Batman fought Brainiac. And in the final analysis and with the three issues taken as a whole it was a good team up between Superman/Batman and the Metal Men. I wouldn't put it up against the two issues of ACTION COMICS from 1987 and 1988 that John Byrne did, but it was still pretty good. All continuity questions aside (which seemed to work themselves out over the course of the three chapters) it was also a good reintroduction of the characters into the new DC. Having said all of that I thought that some of the thematic elements used in the story and this issue in particular were a bit stale. This could come from the sheer number of Superman and Batman comics that I've read over the past twenty years and after awhile certain motivating factors tend to come up again and again and again. It's the blessing and curse of reading thousands of comics; sure you get some fantastic stories but you also get to see the repetition when the universal theme of any characters but especially Superman and Batman get played with by a new generation of writers and creators. Which is an overly worded way of saying that while I appreciate Guggenheim and Verheiden (which sounds like two thirds of a law firm or something) using Bruce's origin to justify his keeping an OMAC prototype because he has trouble letting things go at the same time it seems like two writers bringing up the orphan aspect yet again. I think my main problem is that DC has made such a concerted effort to show that Batman has learned from his mistakes from before INFINITE CRISIS that him keeping an early model of the personification of his paranoia that, you know, tried to kill every metahuman on the planet is a bit off the mark. It just doesn't scan for me. So while it wasn't a terrible story arc (besides that God awful second chapter) I can't totally trash it. There were some good moments, but the confusing continuity and the sloppy characterization really muddied the waters and made it nearly impossible to embrace. I don't know what a brand new reader would make of it. It is possible that I brought a lot of baggage into reading this arc and someone who picked this up as their first experience with SUPERMAN/BATMAN may love it to death. I am factoring that in, but in the end I have to go with my gut and say that I really didn't care for it. It wouldn't be the first time my personal feelings clouded a story. It won't be the last. Art - 4: Nothing really jumped out at me this month to change my opinion of the art. Pat Lee draws great robots and not so great human figures. His versions of Superman and Batman aren't horrendous, they're just not necessarily to my liking. In the end, though, he was a great choice to showcase the new Metal Men and because of that the art was the only thing I consistently liked about this arc. Cover Art - 3: Average. That's the word that popped into my head when I saw this cover. It's an interesting composition and dynamic and all of that, but there isn't a whole lot to get me going either. Yeah, that's about all I have to write about that.